Update – 12/19/2016 – the race published pictures! I talked about each individual picture here, but I want to come back in and put them into this post for anybody that might be looking for reports on this race. Pictures! Aaaaand – we’ve got a continuity issue. I signed up for the Phillips 10K Trail Run without, frankly, knowing what I was doing. This was the second year for the organizers of this event, and a new course for them in Lewis Morris Park near Morristown, New Jersey. I did two things wrong going into this. First, I randomly bought a pair of low-drop trail running shoes online, thinking that they’d be magical. And second, I didn’t really do a lot of training on trails. There was some of that, sure, but they were relatively short runs on relatively well maintained trails. My achilles tendons hurt like mad whenever I wore those shoes, but I tried to ignore it and headed into this race – my first 10K – thinking I was ready. Turns out, I was not. I made the hour drive out to Morristown, and about the time I got there I got a call from my wife saying they had decided to come along, too, and would be there when I finished the race. That was exciting, because this was the first time they were able to come and cheer for me since that first race in March. Head into the parking lot, park the car, open the door, and step into a very strange sound landscape – a low level drone that never ended – a constant buzz with no direction at all. 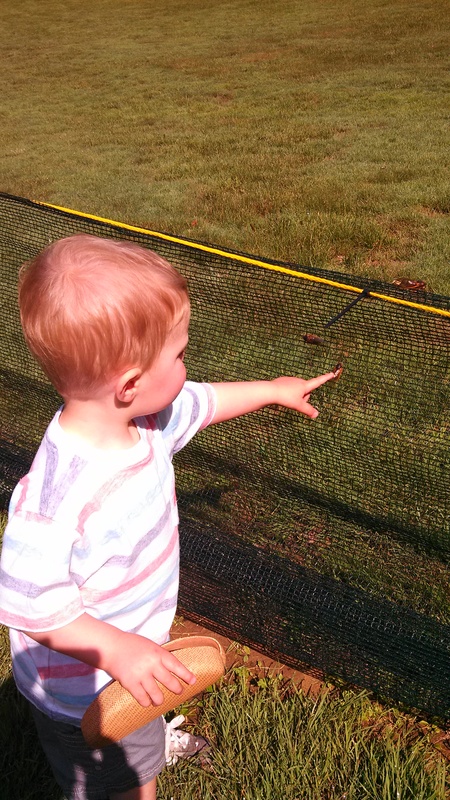 It turned out to be cicadas – this was during the big cicada takeover in the summer of 2013, and they were EVERYWHERE. Flying around, on trees and tables and benches, and just generally making a nuisance of themselves. 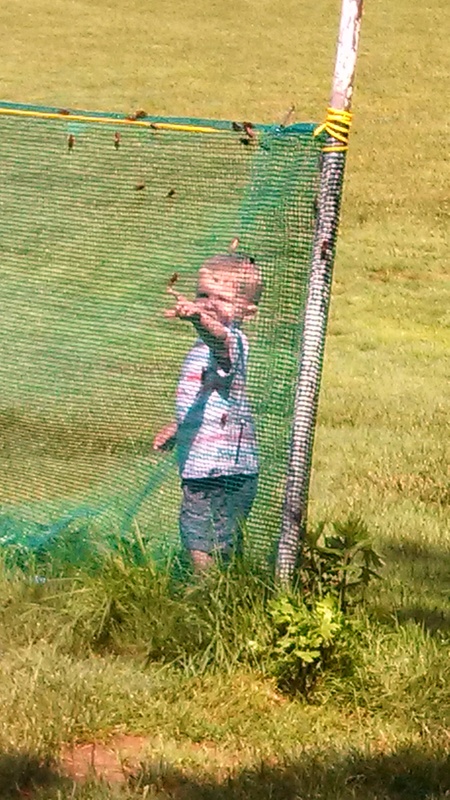 My son, as you might imagine, was fascinated. They lined us up and off we went – the 5K runners (200 – 300 people) went one way, the 10K runners (all 30 or so of us) went the other. The course itself was a hiking / biking single-track through this big park, and was generally pretty. There were a couple of stream crossings and several good hills, and in general it would have been a pleasant hike. There were four things, though, that wound up making it a fairly unpleasant run for me, and then one other really big thing that made it a very unpleasant run for everybody else. 1. I had not anticipated that about 300 – 400 yards into the race the course would drop to single track on a hill – meaning nobody could pass me. I wound up running entirely too fast in the first mile just to try and get out of everybody’s way. That was a mistake. 2. There were proper, 500 – 600 foot elevation gain hills. I hadn’t prepared enough for that, and coupled with a fast start, they wore me down quickly. 3. The course was not closed, and the trail turns out to be popular among mountain bikers. And they, to a man (all men), refused to yield. Dodging the cyclists sucked. 4. About 4 miles in, I had hit a groove and was feeling really good when I stepped on a root and turned my ankle very badly. It was the same ankle that I had injured at the close of my first race, back in March of 2013, and though I was able to eventually walk it off, that mile was more of a stumble than a walk, and certainly not a run. The course came close to the finish line about half a mile before the actual finish line, so I was able to see my wife and son, and she told me about the bigger issue before I looped around and finished. The biggest issue on the course was signage. Because the overall course was a network of hiking trails, there were a lot of intersections and they weren’t always signed very well. But there was a particularly bad one at roughly the 3.5 mile mark. The ground was flat and a trail T-ed off to the right of the direction we were running … and there was a tree right across from that intersection with a sign that could be interpreted as either “Turn Right” or “Go Straight”. What they actually wanted us to do was turn right. I wound up going straight, but not very far before I second guessed it and doubled back. A few yards down the correct path you could see another sign, but only if you looked. Fortunately, I looked, so I didn’t get lost. Others were not so fortunate. One lady apparently had a sizable lead and was going to win the race but missed that turn and tacked on another mile. Several others had the same issue. The crowd at the award ceremony after was not … friendly. After it was all over we got an email from the organizers offering to refund our money, but I don’t think anybody took them up on it. This was the only race I’ve ever run where I came in functionally last (as opposed to DFL). Not technically last – there were two walkers, each of which finished 30 – 45 minutes behind me – but for those of us trying to run it, I came in last by about a minute. The award ceremony was almost over when I crossed the finish line. I was limping, exhausted, and muddy. But my family was there, and I felt prouder to have done that than I think I would have if it were easier – I conquered that sucker, you know? My time was a robust 1 hour, 26 minutes, and 17 seconds, for a 13.55 / mile pace that stands as the worst official performance of my running “career”. – One upside to doing this as my first 10K was that it was extraordinarily easy to PR in the next 10K. – That was the last time I ran in those shoes. I was so sore for the next three days that I needed a scapegoat. They were thrown in the garbage with something like 30 miles on them. – I’m also not convinced that the course was a full 6.1 miles – my watch only said about 5.5 miles, and the mile marker signs never seemed to align with what my watch was saying. But, if they are calling it a 10K, I’m going with it. – This did not sour me on the idea of trail races – in fact, I think I could really enjoy them – but it made me painfully aware that the preparation for trail races is different than the preparation for road races. Especially now that I’m in Florida, that could be challenging. – Decent SWAG – I obviously don’t remember everything in the bag, but they did have a branded refrigerator magnet, and the shirt became one of my favorites – I wore it a lot, as you can see in the picture below. – The next race after this one was the CHK 4K, which I enjoyed a rather lot. First, let us get this out of the way. There is a town in New York state that is called Florida. Florida, New York. Bills itself as The Onion Capital of the World (which is not a throwaway comment -see the notes below). This race did not take place in the state of Florida – it took place in Florida, New York. OK – now that we’ve got that straight. 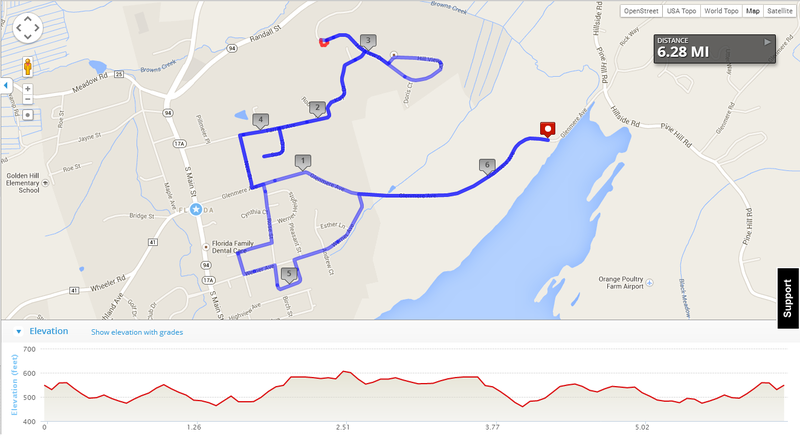 This race was very well done – turns out the race director is the track coach for the local high school, and lives along the route. This is also an established race in a small community, and it felt like half the town showed up to help administer the thing. Just very well done. Some confusion at the pre-registered table, but I got my bib and we got lined up. After thanking what seemed like the whole town and the recorded national anthem, off we went. Now, I’d looked at the course online, so I was mostly prepared for the hills. The race director, in his pre-race remarks, even said, “the race is what it is” in reference to the hills. But, yikes, the hills never stopped. Very little flat ground over the course of the six miles – we were always either going up or going down. Overall I’m pretty happy with my time here – I wound up coming in just under a minute slower than my goal time. The half marathon in three weeks will be very flat relative to this course, and I still felt pretty strong at the end of this one. As a tune up goes, we’ll take it. • This was my first road 10K, so an automatic PR – though I did this quite a lot faster than the trail 10K, so it was a PR no matter what. PR! • Somehow they didn’t have my name on their list at the pre-registered table, and had to get one of the race directors over. When I offered to go get my phone and try to find the receipt for proof, she told me that nobody ever says they’re registered when they didn’t do it, so they got me signed up without me having to pay. I began to doubt myself, and I was completely prepared to send in a check if I couldn’t convince myself that I’d actually paid for it … but I found the receipt pretty quickly. This is one of the reasons we get to races early, and I’ll likely start taking printed receipts to future races just to ease my mind. • Beginning to develop and practice my half marathon strategy – this is now the second run that I’ve taken an energy gel during the run. Both times I’ve noticed markedly less crappy bonks at the end, so THAT’S good. And people say that these can upset your stomach, but I’ve apparently got an iron constitution because I feel nothing. Except all that glorious energy. • Good swag bags – standard cotton shirt, nice technical shirts leftover from a NYRR race in June (these were just randomly put into the bags, and mine is an Adult Small – I lol’ed), many brochures, coupons, & samples, a jar opener, pens and pencils, cookies, and onions. Like a bag with three onions in it. As I’m walking away I get “don’t forget your onions!” This is why I know that Florida, New York, is The Onion Capital of the World. • This race was put on as part of a town festival, and did a great job showcasing the town. I was impressed by Florida, New York. • Six consecutive months running an event, with events scheduled for the next two. I’m going to struggle to get one in in November – my calendar is packed, and the running calendar around here seems to go dark on just the weekends I have available. This little streak may yet wind up being a false start.